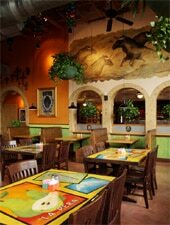 Nicha’s is the quintessential Tex-Mex restaurant, complete with rustic murals and rusty-hued menudo. : Nicha’s, a fixture of the city’s Mission District, can come across as cartoony with its romanticized murals of San Antonio scenes and its mixed-up Spanish/English menu. But it’s impossible not to take the food seriously; it distills the essence of Tex-Mex into dishes as simple as bellwether carne guisada or as profound as the chile relleno with Monterrey Jack and salsa ranchera. We like the fragrant corn tortillas, the toasty salsa and the lard-cooked refried beans. We almost grudgingly respect the chile-topped, over-stuffed Texas fried burrito with your choice of meats in the filling. Slow-roasted pork carnitas marinated in citrus are cause for celebration. And we also celebrate the truly friendly and efficient service, surely as much a part of Tex-Mex as the cumin, yellow cheese, and now tres leches cake. Expect crowds and families.